The biggest threat to good water quality in local rivers, creeks, and streams is polluted stormwater runoff from construction sites, farm fields, parking lots, industrial sites, and business or residential lawn areas. Why? Because stormwater runoff picks up bacteria-containing animal waste, lawn fertilizers, automobile fluids, household and other chemicals, sediment, trash, and debris as it flows - untreated - from these areas directly to local receiving waters. All of these pollutants degrade the receiving waters and often make them unsafe for fishing, swimming, or for use as a source of drinking water. In addition, they damage the aquatic habitat for the fish and other critters that live there. Since most of the nation's streams are not monitored for pollution, it is hard to know about water quality at the local level. However, the Izaak Walton League of America operates a volunteer program to help determine the water quality in the streams, rivers, and creeks across America. Their Save Our Streams (SOS) program is a nationwide effort that supports watershed education through outreach programs. Over the past 30 years, SOS has educated and motivated people to clean up neighborhood streams, monitor stream health, and protect the local wetlands. This unique opportunity is available for students, scouts, and families to become trained to monitor local streams and rivers. You could end up developing a monitoring network in your own community. For more information, visit the Virginia Save Our Streams website. Another way to serve your community is by making fellow citizens aware of stormwater runoff pollution by stenciling storm drain inlets. Many people mistakenly believe that stormwater runoff is treated before emptying into nearby waterways. 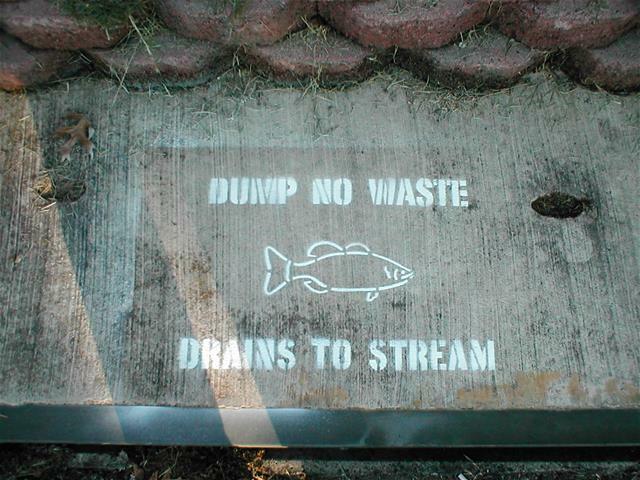 These painted messages remind residents of the link between streets and a waterway's health. It's a community effort with lasting effects. For more information, please download this informational handout.